GRAND PRAIRIE, Texas — The Grand Prairie Fire Department is going through some kind of a growth spurt, and it's absolutely adorable. In a photo shoot, proud parents show off their bundles of joy, 10 babies in total, seven girls and three boys, ranging between 3-12 months old. Posing beside fire trucks, firefighters dressed in gear held their babies, dressed in white onesies with GFPD written on the bottom. 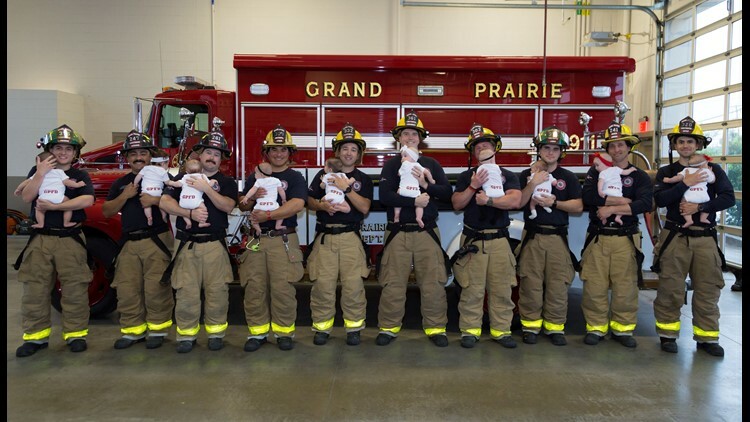 The Grand Prairie Fire Department posted the announcement on its Facebook page: "Baby Boom at GPFD! Can it get any more adorable than this? Meet 10 of our newest family members. Thank you Jen Morris Photography! #cutenessoverload #firefighting #family #GPFD39"